An honour granting Aung San Suu Kyi the Freedom of Oxford has been withdrawn by the city’s council because of her response to the Rohingya crisis. 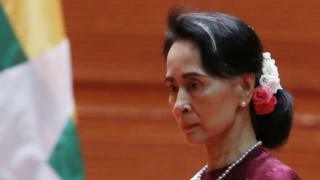 The de facto leader of Myanmar was granted the honour in 1997 for her “long struggle for democracy”. But a motion to Oxford City Council said it was “no longer appropriate” for her to hold it. But her failure to denounce the military or address allegations of ethnic cleansing has been criticised by world leaders and groups like Amnesty International. “I think it is perfectly natural to look around for ways of saying we disapprove utterly of what you are doing,” he told BBC Radio Oxford. Oxford City Council leader Bob Price supported the motion to remove her honour and confirmed it was an “unprecedented step” for the local authority. Last week it emerged St Hugh’s College, Oxford, had removed a portrait of Ms Suu Kyi from display.